What an exciting experience to move art by contemporary artists, both established and emerging! At Fine Art Shippers, we are proud and very happy to work with such talents as Henry Richardson, Will Yaya, Tigran Tsitoghdzyan, and Vladimir Nazarov, shipping paintings and sculptures for them across the United States and internationally. In this blog post, we want to tell you about one more amazing person we were so lucky to get acquainted with at Art d’Aurelle Gallery in New York. We are now talking about Alben, a young and very talented French artist creating true masterpieces of contemporary art. To move art for Alben is a pure pleasure and a big honor for each member of our team! There are many great contemporary French artists working in diverse media. However, Alben stands out from the crowd for several reasons. First of all, whether it comes to painting or sculpture, each piece created by this Normandy-born artist represents a somewhat combination of Pop Art and Classical Art with all its many canonized forms and figures. Secondly, Alben largely works with resin, plastic, and other unusual materials, making his creations truly one-of-a-kind. It is also worth noting that Alben began his career with street graffiti and stencils, which gives another interesting effect to each art piece made by this talented person. 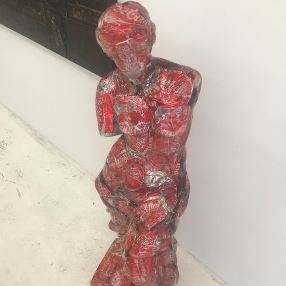 At Fine Art Shippers, we love to move art for Alben, and we highly recommend his fascinating works to everyone looking for unique contemporary art of the highest quality!